Getting to know some of our favorite children’s book creatives is our favorite part of the job, and we’re delighted to introduce you to Nina Crittenden. Nina is the illustrator of Chicken Lily, as well as the author and/or illustrator of several other children’s books. She currently lives in Minnesota with her kids, pugs, guinea pig, bunny, and fish and enjoys drinking tea and doing some occasional knitting. Bookroo: Can you describe your process for creating the illustrations for a book, from start to finish? Nina: I read the manuscript through first and start sketching right away (usually on the manuscript). Character sketches help me to get to know the players better. Small (thumbnail sketches) help me get the pacing of the story right and make sure that all the pictures flow together well. Everything gets sent to the editor and art director many times during the process, they let me know what’s working and what I need to change to make the pictures the best they can be. I then make full-size sketches and once they are approved, create the final artwork. Then I cross my fingers and send all the paintings to my publisher in the mail. And eventually it turns into a real book! Bookroo: What are your favorite materials to illustrate with? Nina: I ink with Micron pens on Aquarelle Arches hot-pressed watercolor paper and paint with Prang watercolors. Bookroo: We’ve heard you have a great love of animals, extending to your becoming a veterinary technician. Tell us about your pets, and where you encounter other animals that inspire you. Nina: Gordy and Jilly are our nine-year-old pugs (they are littermates and two-thirds of The Three Little Pugs). My eldest daughter has a Netherland dwarf bunny called Pickles. My youngest daughter has a guinea pig called Mabel. We also have a betta fish called Kevin. My daughters have been taking horseback riding lessons so that gets us plenty of horse time. Our backyard bird feeders are well-stocked so we have lots of squirrels and rabbits and birds keeping us company. From having pets of my own to caring for other people’s pets, I cannot imagine life without them. Animals are our dearest friends. My "Dream Pet Wish List" includes (but is not limited to) a horse, a duck, a panda, and some otters. 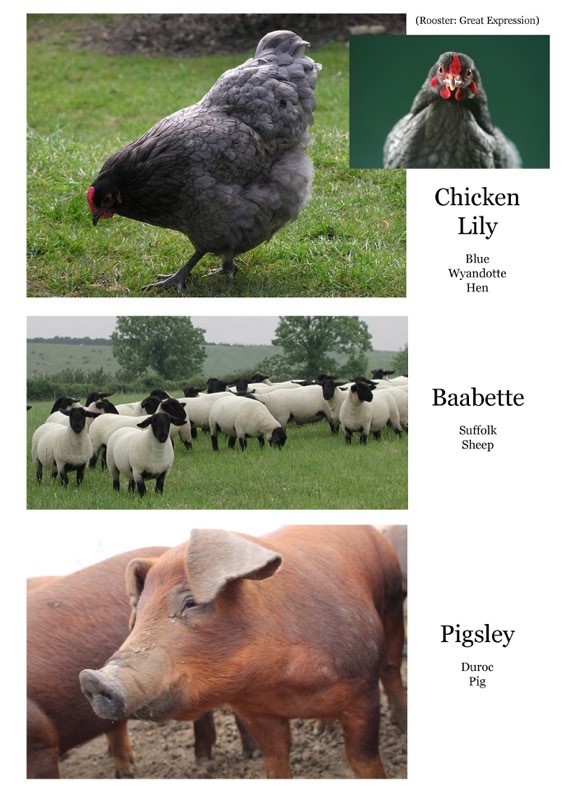 Bookroo: We were delighted to send out Chicken Lily. What references did you use (if any) when creating Lily and her animal friends? Nina: My original thought was to make Lily a little blue hen because she seemed so blue all the time. My editor suggested yellow, which ended up being absolutely perfect. Lily, Pigsley, Baabette, and Mrs. Lop were the only characters in the manuscript. It was fun to be able to add other kids to the story (including Lori Mortensen’s fluffy cat, Max, as one of Lily’s classmates). 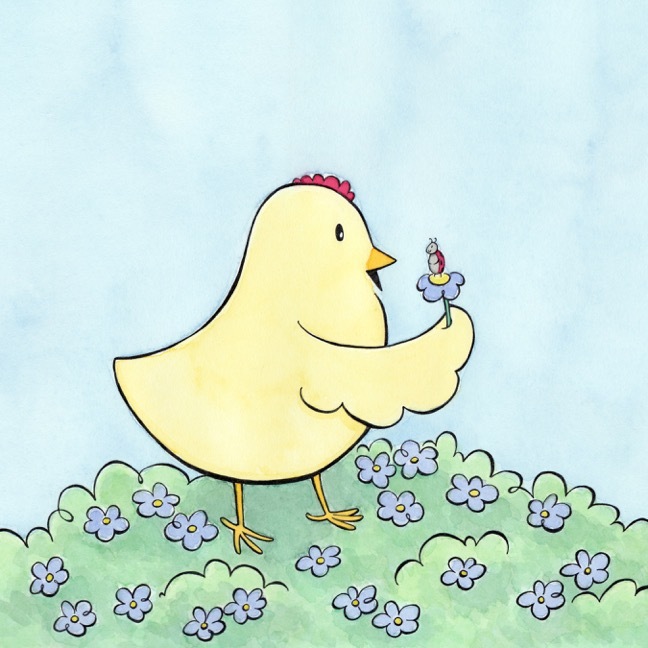 Bookroo: Are there any fun little details in Chicken Lily’s illustrations little readers should watch for? Nina: Lily has a little ladybug friend that is fun to find in all the pictures. William the goat can be spotted eating things he isn’t supposed to be eating (i.e. the apple on Mrs. Lop’s desk). Shelley and Bonnie are besties. Lily’s favorite activity is bowling. Bookroo: You’re an author in addition to being an illustrator. 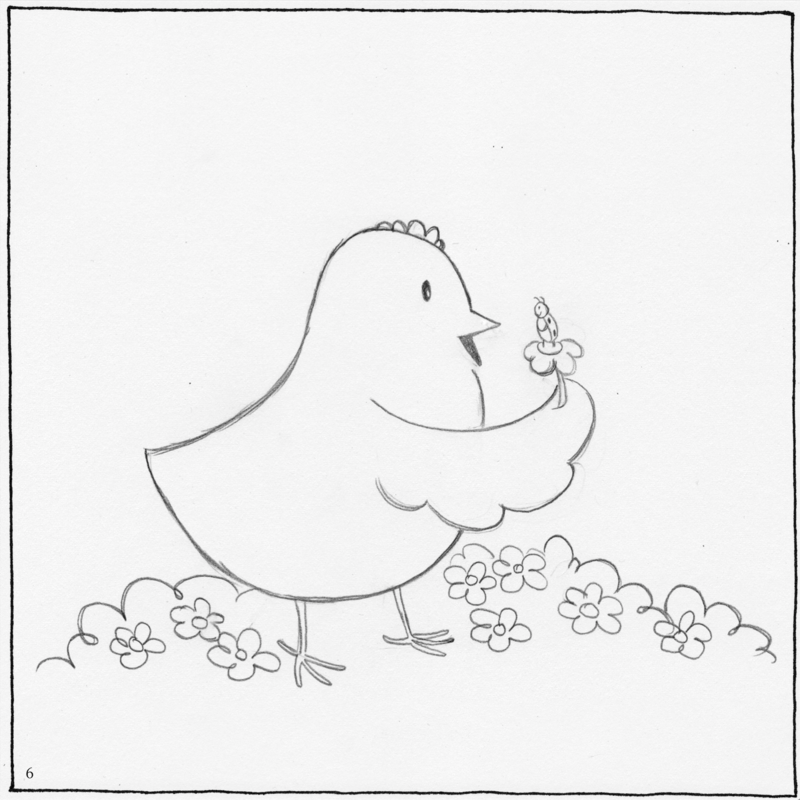 When you’re both writing and illustrating a story, which comes first for you? Nina: When I illustrate a story that someone else has written, I am able to jump right in and start sketching. When it’s a story that I am writing, there is a lot more back-and-forth between changing the words and changing the pictures to get it just right. I haven’t figured out which part comes first; the chicken or the egg. Bookroo: What does a typical workday look like for you? Nina: My day is usually spent working on whatever is on the top of my to-do list. Whenever I am working on one thing, ideas for other things pop into my mind (which is a perk of keeping busy). I also spend a great deal of time letting my pugs outside and then back in again. Bookroo: What was the biggest challenge of getting your very first book published? Nina: I sent out a promotional postcard and it connected with a publisher who liked my work and thought it would be a good fit for a book they were going to publish. Probably the biggest challenge for me was believing that I was actually capable of doing it. My oldest daughter was in half-day kindergarten at time (and my youngest was a very busy toddler), so I was very fortunate to have the whole school year to work on the final art for the book. I learned to work very hard in small chunks of time, a strategy that works the best for me to this day. Bookroo: How do your spouse and children influence your work? Nina: They are such a great source of support. I love being able to talk to them about ideas and show them works-in-progress. My husband is terrific at helping me with grammar and punctuation. They are all more than happy to let me know if my ideas are good or super lame. Bookroo: What is your favorite experience meeting a young fan? Nina: My favorite thing is when little kids start telling me about their own pets, it is the cutest. Bookroo: Do you have a favorite memory of reading one of your books aloud? Nina: When it was time to read Chicken Lily aloud at my book launch party, I quite literally chickened out and was unable to read the book myself. Angela, one of the booksellers, offered to read the book for me while I drew a picture of Lily on a big pad of paper so everything worked out great! When The Three Little Pugs was published two years later, sweet Angela sat next to me holding up a copy of the book while I read my story aloud. That is probably my favorite memory and I am eternally grateful for Angela’s kindness and generosity. Bookroo: Who are some of your role models in the children’s book realm? Nina: Richard Scarry, Astrid Lindgren, Arnold Lobel, Beatrix Potter, James Marshall, Marjorie Flack, and Fred Gwynne for starters. There are far too many people that I admire on a daily basis in modern times. Children’s literature is an inspiring and humbling field to be in, I love it all. Bookroo: We’re a community of book lovers! Do you have any upcoming projects you can tell us about? Nina: I just finished the art for a new promotional postcard, so that always is exciting to see if anything will come of it (I liken it to buying a lottery ticket). I have a handful of stories that I am working on writing and illustrating myself, so I am looking forward to polishing one up and getting ready to submit it to publishers soon. It may include (but is not limited to) a horse, a duck, a panda, and some otters. We really appreciate the opportunity to get to know Nina better and learn more about her work as an illustrator. You can learn even more about her and see more of her work on her website! All images courtesy of Nina Crittenden.